Learn how to create basic formulas. Understand relative referencing when copying and pasting formulas. Work with complex formulas by controlling the order of mathematical operations. This section reviews the fundamental skills for entering formulas into an Excel worksheet. The objective used for this chapter is the construction of a personal cash budget. Most financial advisors recommend that all households construct and maintain a personal budget to achieve and maintain strong financial health. Organizing and maintaining a personal budget is a skill you can practice at any point in your life. Whether you are managing your expenses during college or maintaining the finances of a family of four, a personal budget can be a vital tool when making financial decisions. Excel can make managing your money a fun and rewarding exercise. Figure 2.1 shows the completed workbook that will be demonstrated in this chapter. Notice that this workbook contains four worksheets. The first worksheet, Budget Summary, contains formulas that utilize or reference the data in the other three worksheets. As a result, the Budget Summary worksheet serves as an overview of the data that was entered and calculated in the other three worksheets of the workbook. Formulas are used to calculate a variety of mathematical outputs in Excel and can be used to create virtually any custom calculation required for your objective. Furthermore, when constructing a formula in Excel, you use cell locations that, when added to a formula, become cell references. This means that Excel uses, or references, the number entered into the cell location when calculating a mathematical output. As a result, when the numbers in the cell references are changed, Excel automatically produces a new output. This is what gives Excel the ability to create a variety of what-if scenarios, which will be explained later in the chapter. 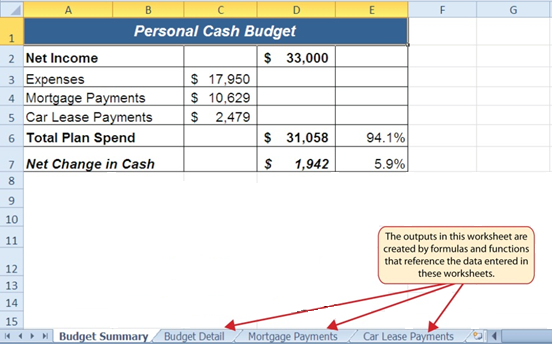 To demonstrate the construction of a basic formula, we will begin working on the Budget Detail worksheet in the Personal Budget workbook, which is shown in Figure 2.2. To complete this worksheet, we will add several formulas and functions. Table 2.1 provides definitions for each of the spend categories listed in the range A3:A11. When you develop a personal budget, these categories are defined on the basis of how you spend your money. It is likely that every person could have different categories or define the same categories differently. Therefore, it is important to review the definitions in Table 2.1 to understand how we are defining these categories before proceeding. Taxes Money spent on school and property taxes (this example of the personal budget assumes that we own property). Open the Data file named CH2 Data and use the File/Save As command to save it with the new name CH2 Personal Budget. Type an equal sign =. When the first character entered into a cell location is an equal sign, it signals Excel to perform a calculation or produce a logical output. Type D3. This adds D3 to the formula, which is now a cell reference. Excel will use whatever value is entered into cell D3 to produce an output. Type the slash symbol /. This is the symbol for division in Excel. As shown in Table 2.2 the mathematical operators in Excel are slightly different from those found on a typical calculator. Type the number 12. This divides the value in cell D3 by 12. In this formula, a number, or constant, is used instead of a cell reference because it will not change. In other words, there will always be 12 months in a year. Cell references enable Excel to dynamically produce new outputs when one or more inputs in the referenced cells are changed. Cell references also allow you to trace how outputs are being calculated in a formula. As a result, you should never use a calculator to determine a mathematical output and type it into the cell location of a worksheet. Doing so eliminates Excel’s cell-referencing benefits as well as your ability to trace a formula to determine how outputs are being produced. Figure 2.3 shows how the formula appears in cell C3 before you press the ENTER key. Figure 2.4 shows the output of the formula after you press the ENTER key. The Monthly Spend for Household Utilities is $250 because the formula is taking the Annual Spend in cell D3 and dividing it by 12. If the value in cell D3 is changed, the formula automatically produces a new output. We are calculating the spend per month for each category because people often get paid and are billed for these items on a monthly basis. This formula allows you to compare your monthly income to your monthly bills to determine whether you have enough income to pay these expenses. If you are using constants, or numerical values, in an Excel formula, they should be universal constants that do not change, such as the number of days in a week, weeks in a year, and so on. Do not type the values that exist in cell locations into an Excel formula. This will eliminate Excel’s cell-referencing benefits, which means if the value in the cell location you are using in a formula is changed, Excel will not be able to produce a new output. Place the mouse pointer over the Auto Fill Handle. When the mouse pointer turns from a white block plus sign to a black plus sign, click and drag down to cell C11. This pastes the formula into the range C4:C11. Double click cell C6. Notice that the cell reference in the formula is automatically changed to D6. Figure 2.5 shows the outputs added to the rest of the cell locations in the Monthly Spend column. For each row, the formula takes the value in the Annual Spend column and divides it by 12. You will also see that cell D6 has been double clicked to show the formula. Notice that Excel automatically changed the original cell reference of D3 to D6. This is the result of relative referencing, which means Excel automatically adjusts a cell reference relative to its original location when it is pasted into new cell locations. In this example, the formula was pasted into eight cell locations below the original cell location. As a result, Excel increased the row number of the original cell reference by a value of one for each row it was pasted into. Relative referencing is a convenient feature in Excel. When you use cell references in a formula, Excel automatically adjusts the cell references when the formula is pasted into new cell locations. If this feature were not available, you would have to manually retype the formula when you want the same calculation applied to other cell locations in a column or row. Click cell F3 in the Budget Detail worksheet. Type an equal sign =. Type an open parenthesis (. Click cell D3. This will add a cell reference to cell D3 to the formula. When building formulas, you can click cell locations instead of typing them. Type a minus sign −. Click cell E3 to add this cell reference to the formula. Type a closing parenthesis ). Type the slash / symbol for division. Click cell E3. This completes the formula that will calculate the percent change of last year’s actual spent dollars vs. this year’s budgeted spend dollars (see Figure 2.6). Click cell F3 to activate it. When the mouse pointer turns from a white block plus sign to a black plus sign, click and drag down to cell F11. This pastes the formula into the range F4:F11. ( ) Override Standard Order: Any mathematical computations placed in parentheses are performed first and override the standard order of operations. If there are layers of parentheses used in a formula, Excel computes the innermost parentheses first and the outermost parentheses last. ^ First: Excel executes any exponential computations first. * or / Second: Excel performs any multiplication or division computations second. When there are multiple instances of these computations in a formula, they are executed in order from left to right. 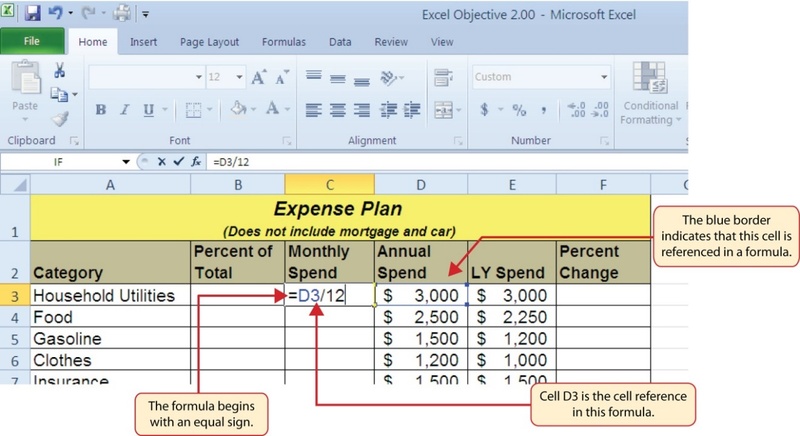 + or − Third: Excel performs any addition or subtraction computations third. When there are multiple instances of these computations in a formula, they are executed in order from left to right. Figure 2.6 shows the formula that was added to the Budget Detail worksheet to calculate the percent change in spending. The parentheses were added to this formula to control the order of operations. Any mathematical computations placed in parentheses are executed first before the standard order of mathematical operations (see Table 2.3). In this case, if parentheses were not used, Excel would produce an erroneous result for this worksheet. Figure 2.7 shows the result of the percent change formula if the parentheses are removed. The formula produces a result of a 299900% increase. Since there is no change between the LY spend and the budget Annual Spend, the result should be 0%. However, without the parentheses, Excel is following the standard order of operations. This means the value in cell E3 will be divided by E3 first (3,000/3,000), which is 1. Then, the value of 1 will be subtracted from the value in cell D3 (3,000−1), which is 2,999. Since cell F3 is formatted as a percentage, Excel expresses the output as an increase of 299900%. Does the Output of Your Formula Make Sense? It is important to note that the accuracy of the output produced by a formula depends on how it is constructed. Therefore, always check the result of your formula to see whether it makes sense with data in your worksheet. As shown in Figure 2.7, a poorly constructed formula can give you an inaccurate result. In other words, you can see that there is no change between the Annual Spend and LY Spend for Household Utilities. Therefore, the result of the formula should be 0%. However, since the parentheses were removed in this case, the formula is clearly producing an erroneous result. Click or type a cell location. If using constants, type a number. Use parentheses where necessary to control the order of operations. 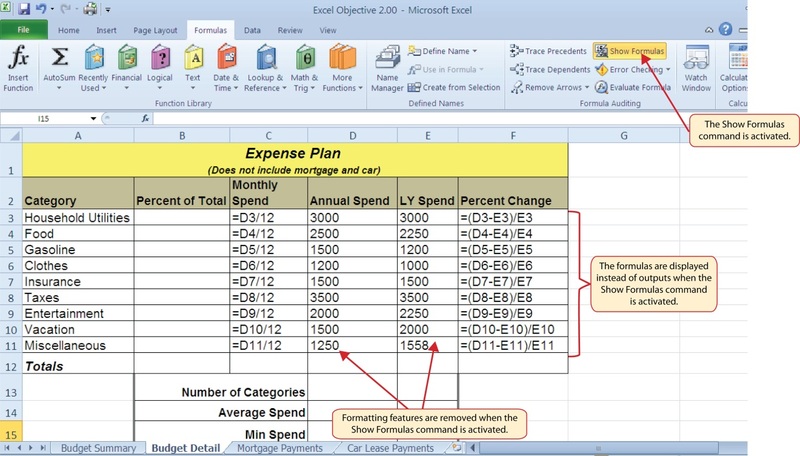 With the Budget Detail worksheet open, click the Formulas tab of the Ribbon. Click the Show Formulas button in the Formula Auditing group of commands. This displays the formulas in the worksheet instead of showing the mathematical outputs. Click the Show Formulas button again. The worksheet returns to showing the output of the formulas. 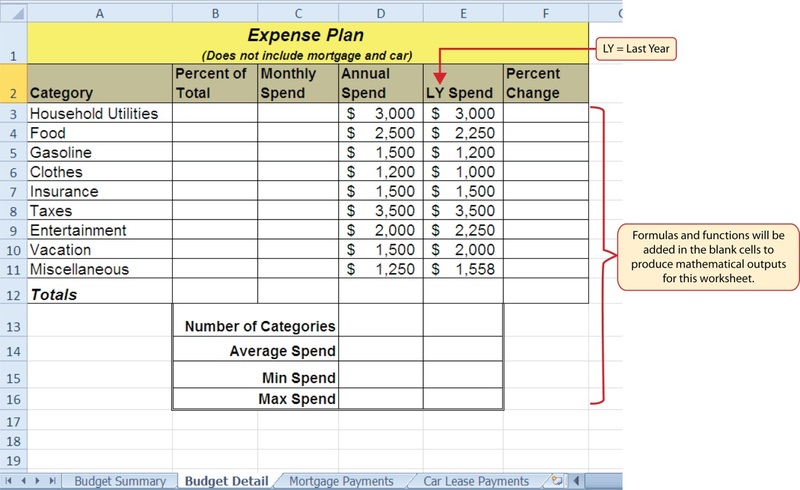 Figure 2.8 shows the Budget Detail worksheet after activating the Show Formulas command in the Formulas tab of the Ribbon. As shown in the figure, this command allows you to view and check all the formulas in a worksheet without having to click each cell individually. After activating this command, the column widths in your worksheet increase significantly. The column widths were adjusted for the worksheet shown in Figure 2.8 so all columns can be seen. The column widths return to their previous width when the Show Formulas command is deactivated. Click the Show Formulas button in the Formula Auditing group of commands. Click the Show Formulas button again to show formula outputs. Hold down the CTRL key while pressing the accent symbol `. 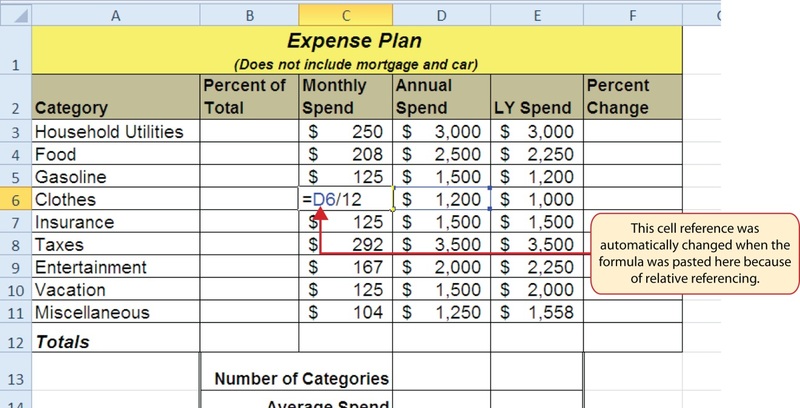 Click cell D3 in the Budget Detail worksheet. Click the Trace Dependents button in the Formula Auditing group of commands in the Formulas tab of the Ribbon. A double blue arrow appears, pointing to cell locations C3 and F3 (see Figure 2.9). This indicates that cell D3 is referenced in formulas that are entered in cells C3 and F3. Click the Remove Arrows command in the Formula Auditing group of commands in the Formulas tab of the Ribbon. This removes the Trace Dependents arrow. Click the Trace Precedents button in the Formula Auditing group of commands in the Formulas tab of the Ribbon. A blue arrow running through cells D3 and E3 and pointing to cell F3 appears (see Figure 2.10). This indicates that cells D3 and E3 are references in a formula entered in cell F3. Click the Remove Arrows command in the Formula Auditing group of commands in the Formulas tab of the Ribbon. This removes the Trace Precedents arrow. Save the Ch2 Personal Budget file. Figure 2.9 shows the Trace Dependents arrow on the Budget Detail worksheet. The blue dot represents the activated cell. The arrows indicate where the cell is referenced in formulas. Figure 2.10 shows the Trace Precedents arrow on the Budget Detail worksheet. The blue dots on this arrow indicate the cells that are referenced in the formula contained in the activated cell. The arrow is pointing to the activated cell location that contains the formula. Click a cell location that contains a number or formula. Click the Trace Dependents button in the Formula Auditing group of commands. Use the arrow(s) to determine where the cell is referenced in formulas and functions. Click the Remove Arrows button to remove the arrows from the worksheet. Click a cell location that contains a formula or function. Click the Trace Precedents button in the Formula Auditing group of commands. Use the dot(s) along the line to determine what cells are referenced in the formula or function. Click the Remove Arrows button to remove the line with the dots. Mathematical computations are conducted through formulas and functions. An equal sign = precedes all formulas and functions. Formulas and functions must be created with cell references to conduct what-if scenarios where mathematical outputs are recalculated when one or more inputs are changed. Mathematical operators on a typical calculator are different from those used in Excel. Table 2.2 “Excel Mathematical Operators” lists Excel mathematical operators. When using numerical values in formulas and functions, only use universal constants that do not change, such as days in a week, months in a year, and so on. Relative referencing automatically adjusts the cell references in formulas and functions when they are pasted into new locations on a worksheet. This eliminates the need to retype formulas and functions when they are needed in multiple rows or columns on a worksheet. Parentheses must be used to control the order of operations when necessary for complex formulas. Formula auditing tools such as Trace Dependents, Trace Precedents, and Show Formulas should be used to check the integrity of formulas that have been entered into a worksheet. 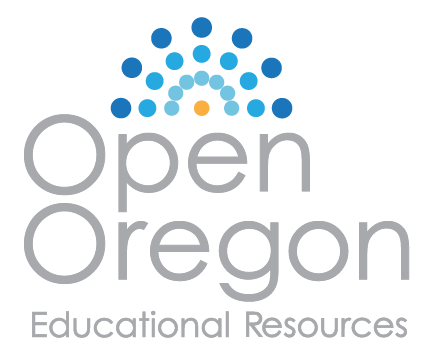 Adapted by Mary Schatz from How to Use Microsoft Excel: The Careers in Practice Series, adapted by The Saylor Foundation without attribution as requested by the work’s original creator or licensee, and licensed under CC BY-NC-SA 3.0.